Do you ever dream of winning the lottery? Do you ever wonder what you would do with that amazing, life changing jackpot full of cash? Perhaps you would pay down debt, buy a new house or a new car. Maybe you would take that ultimate dream vacation you have always wanted to take, but could never afford due to lack of funds and lack of time. Millions of people play the lottery every day, hoping for that awesome payoff. Most people simply choose a string of random numbers, or maybe significant dates, such as birthdays and anniversaries, and hope for the best. But is that really the best way to win? Can You Increase Your Odds of Winning the Lottery? In order to better understand how to increase your chances of winning the lottery, you first have to understand the way that a lottery actually works. The very first thing that you do, of course, is buy the ticket. At this point, you will choose numbers from within a certain range, which has been set by the lottery host. When the time comes to select a winning ticket, numbers will be drawn at random. If lady luck is on your side and you have chosen all the numbers, then you will be a big winner. If, however, you don’t have all the winning numbers, do not despair because it is still possible to be a winner if you have chosen even a few of the winning numbers. While admittedly it is ultimately the luck of the draw, there are still a few things that you can do that may increase your chances of winning the lottery. Consider pooling your lottery money with other lottery players. 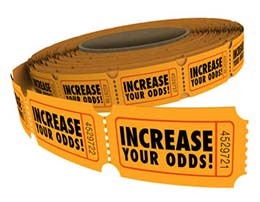 This increases the number of tickets purchased and increases your odds of winning. Choose a wide variety of even and odd numbers. If you play significant date numbers, such as birthdays and anniversaries—which are limited in range of 0-31—add a higher number to avoid sharing your jackpot with other winners. Play scratch off cards. They have better odds, but lesser pay outs. Avoid playing consecutive numbers. In the 5 winning numbers scenario, in which the numbers only go up to 55, pick numbers which will total a sum into the 104-176. 70% of winning lottery numbers fall into this range. Here’s wishing you the best of luck at winning the lottery!